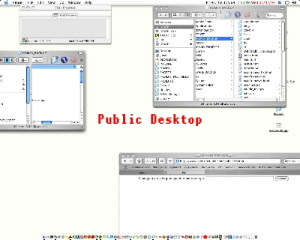 Public Desktop | JONAH BRUCKER-COHEN, PH.D. Public Desktop – JONAH BRUCKER-COHEN, PH.D. I just made this project called Public Desktop. It is similar to my Status Play project, which is about adding sociability to the Mac OSX iChat status line. Public Desktop (screenshot above) lets people input text online which then becomes my desktop here at work. If two people are running the main application, it becomes a desktop IM client of sorts. Future versions will include image lookups and other types of live inputs as desktop images… I am running it now so if you want to send a message to me go here. Note: I will include a link on my projects page soon for people to download the app. Right now it only runs on Mac OSX (Jag or higher). what happens to text that is put in when your pc is offline?